This page contains collected educational materials about the Great Lakes ecosystem. Just like the description says, this is an overview and some statistics about The Great Lakes from the Environment Canada website. Great Lakes and Wisconsin Water Facts from University of Wisconsin Sea Grant Institute. This hilarious educational video from 1968 is so bad it's good. It's 17 minutes long, available online and includes a lesson plan. The New York State Department of Environmental Conservation has created lesson plans and teaching resources for teachers to integrate pond ecology into their classroom. Some resources are detailed lessons, which include direct curricular links to PLO’s while others are worksheets and activities with more general applications. Follow this link to find a .zip file with the assembled materials as well as a guide to the resources and their application. Fisheries Learning on the Web (FLOW) is a fantastic resource! Curriculum designed to be an engaging cost-effective tool for educators. Lesson content clearly addresses lesson objectives, based on content expectations and benchmarks. Includes meaningful assessment tools with learning objectives, student performance and recommended points. Links to supplemental classroom materials. Engages K-12 educators and students with hands-on activities and high quality graphics, such as fish cards. This is a fun activity booklet for Grades 1 and 2 which teaches students about the life and ecology of the Redside Dace. 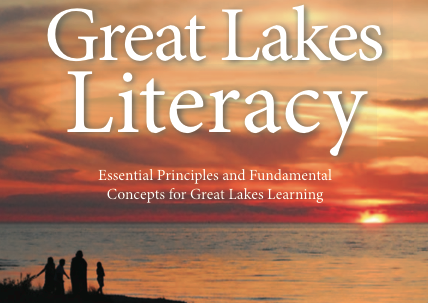 "The target audience for the Great Lakes Literacy principles was teachers of grades K-12. Educators, both formal and informal, of learners of all ages are the audience for Great Lakes Literacy efforts. Textbooks currently used for biology, Earth and environmental sciences pay scant attention to the Great Lakes, and only a few isolated questions on state tests give evidence that the lakes are part of the science curriculum at all. Likewise, there is a need to redress the lack of ocean content in standard science curricula. COSEE Great Lakes has matched the Great Lakes Literacy concepts with national science education standards." The Lake Erie Literacy Principles provide a unified, strategic message for Lake Erie education and outreach efforts throughout the watershed. Educators, within our schools as well as those who work in museums, science centers, and other place-based education sites, are the primary target audience for the Lake Erie Principles. All Ocean, Great Lakes and Lake Erie Literacy Principles and Fundamental Concepts have been aligned with the National Science Education Standards.